I might dream about dinner all day, but I’m not always great at planning for it. Most nights I arrive at 6:30 feeling pretty unprepared. It’s always then that I ask myself, On a scale of 1 to pathetic, how sad is the vegetable drawer right now? So you can imagine why some of my favorite recipes are meals I can throw together with whatever I have in the pantry (with or without fresh ingredients)! 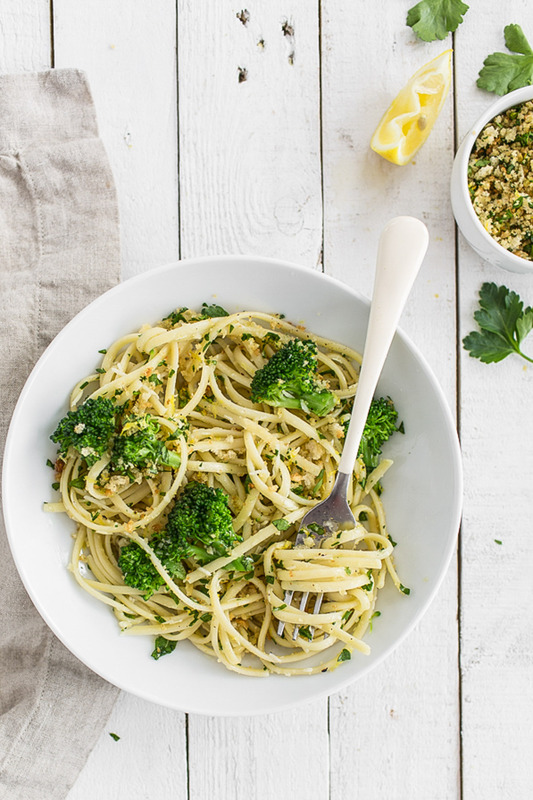 This linguine with broccoli and crispy bread crumbs is just that — quick, delicious, and easy to prepare any night of the week. And it works with fresh or frozen broccoli, which saves you when your veggie drawer is at its lowest point (but don’t shame it!). 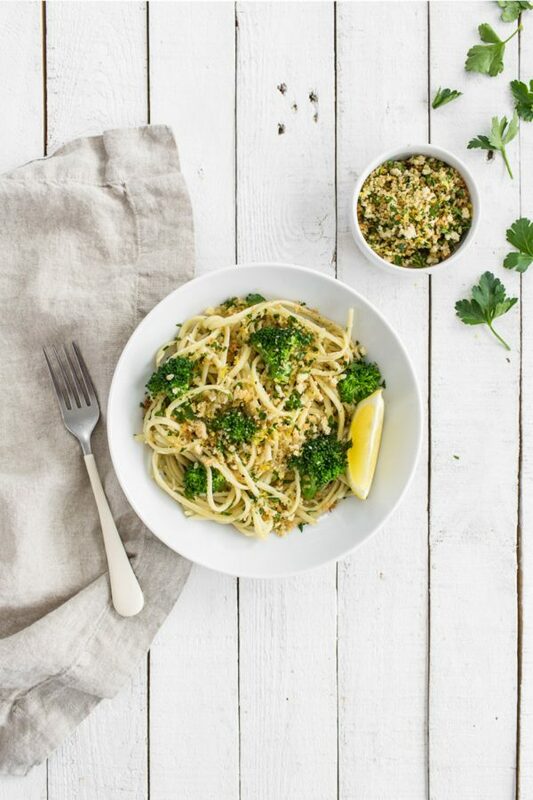 All you need to do is boil the pasta, and in the meantime, toast up a flavorful bread crumb topping with panko, garlic, lemon zest, and parsley. 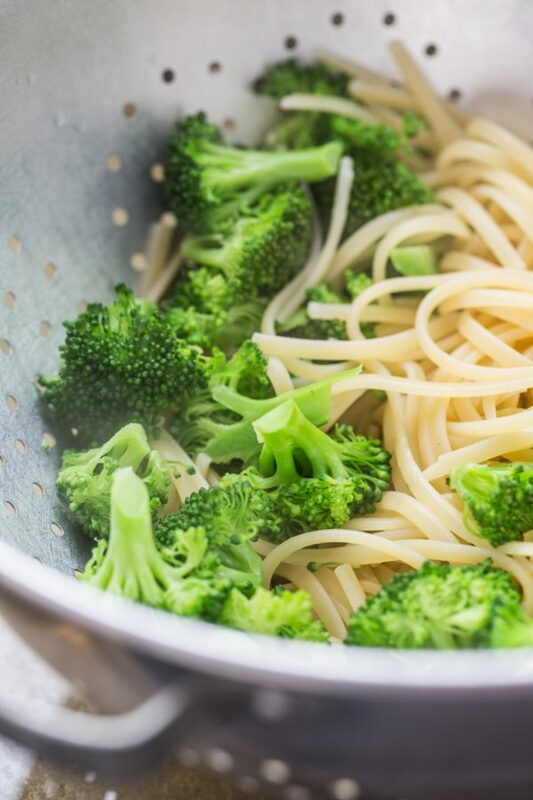 In the last few minutes of boiling the linguine, add a head of chopped broccoli to the boiling water, which ups the fiber content and helps to bulk up each serving for a more filling meal. Toss the linguine and broccoli with olive oil, Parmesan, fresh basil, and top with the crispy lemon-parsley bread crumbs. Crispy bread crumbs should always be on pasta — especially these ones, because they’re bright and refreshing, and just sincerely meant to be nestled into a dish with Parmesan cheese. This meal is yours on any weeknight, friends! In a large pot of salted water, boil the pasta according to package directions. In a large nonstick skillet, heat 1 tablespoon of the olive oil over medium heat, add the breadcrumbs and garlic and cook, stirring constantly, until the breadcrumbs are golden and crisp, 2 to 3 minutes. Transfer to a bowl and stir in half of the lemon zest, 2 tablespoons of the parsley, and a pinch of salt and pepper. In the last 2 minutes of boiling the pasta, use a ladle or a heat-proof measuring cup to scoop out ½ cup of the cooking liquid and set it aside. Add the broccoli to the pot with the pasta and let it boil until bright green and just tender, 2 minutes. Drain the pasta and broccoli and transfer to a large bowl. Drizzle with the remaining 2 tablespoons of olive oil and toss to coat. Add the reserved cooking liquid and the remaining lemon zest and stir. Add the Parmesan cheese and the basil. Divide the pasta among 4 bowls and top evenly with the breadcrumbs. Serve immediately. I love broccoli in pasta! This sounds wonderful! 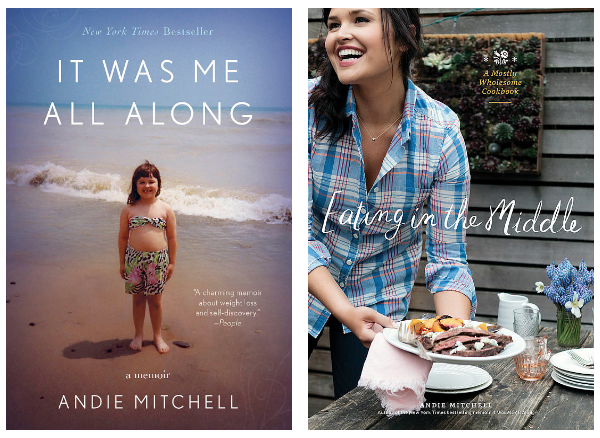 Also, I am LOVING your new book Andie! So gorgeous and so much deliciousness! This is beautiful and perfect for a weeknight dinner. I might even add some chicken sausage! 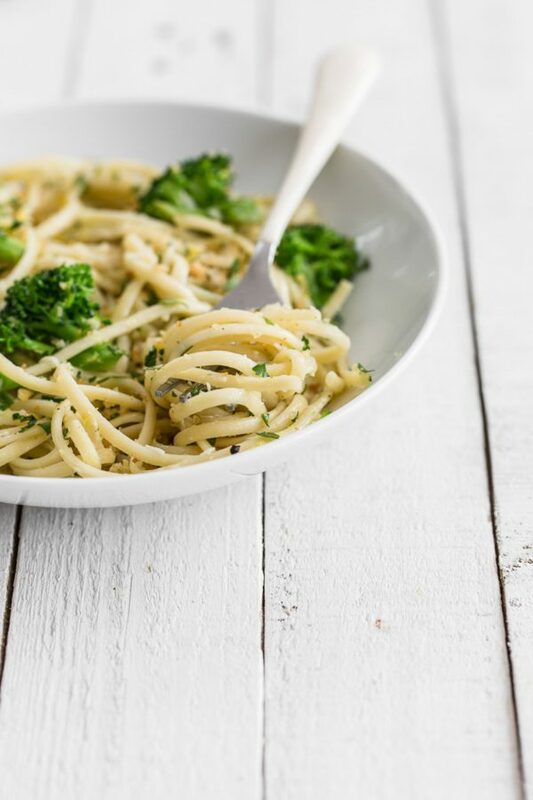 This has become a sort of stand-by quick evening meal on busy weekdays.. That the broccoli can be thrown right into the same pot to cook with the pasta was something of a revelation : ) This works well with frozen broccoli too, which is something I keep on hand. Thanks!